Tallulah’s is a nice little restaurant up in Capitol Hill. Most of the food on their menu is vegan/vegetarian but worry not meat lovers, they do have meat options! 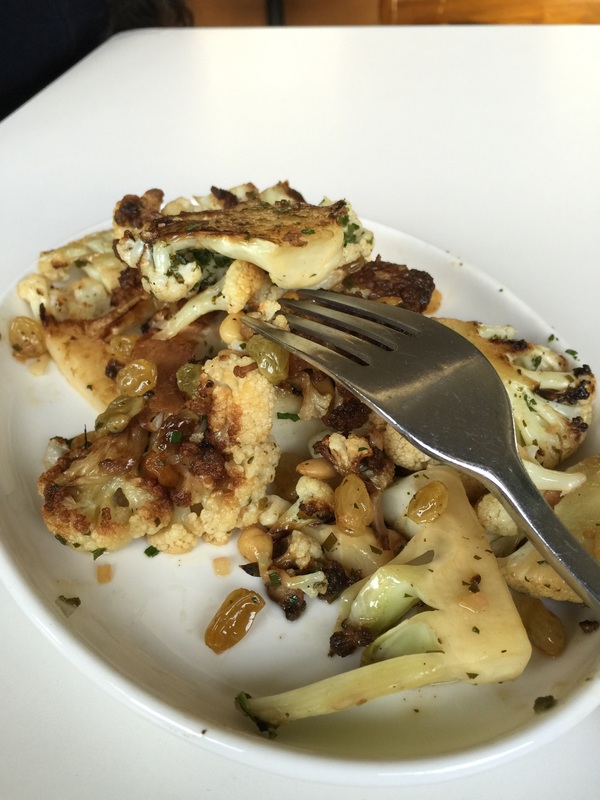 One of their most popular dishes is a cauliflower that has been caramelized then tossed in a pan with roasted pine nuts and raisins, seasoned with salt, lemon juice and herbs. Doesn’t that just sound mouth watering? If so, you should go to Tallulah’s right now and go have a go at it for yourself! We got to help prep the ingredients of that very dish! Then we got to eat it! Yup! That’s something you don’t hear very often, a bunch of high schoolers in the back of the kitchen touching food that other people will eat!? No it can’t be! Well that’s what we did! Chef Walter trusted us to do just that. But before I go into anymore detail lets go back to that very morning when we first got there. He gave us a tour of the kitchen first. When we went inside the freezer, I learned that by keeping a wet towel over seafood, like clams, helps keep them alive longer. While we were in there their produce guy came and delivered the fresh produce. 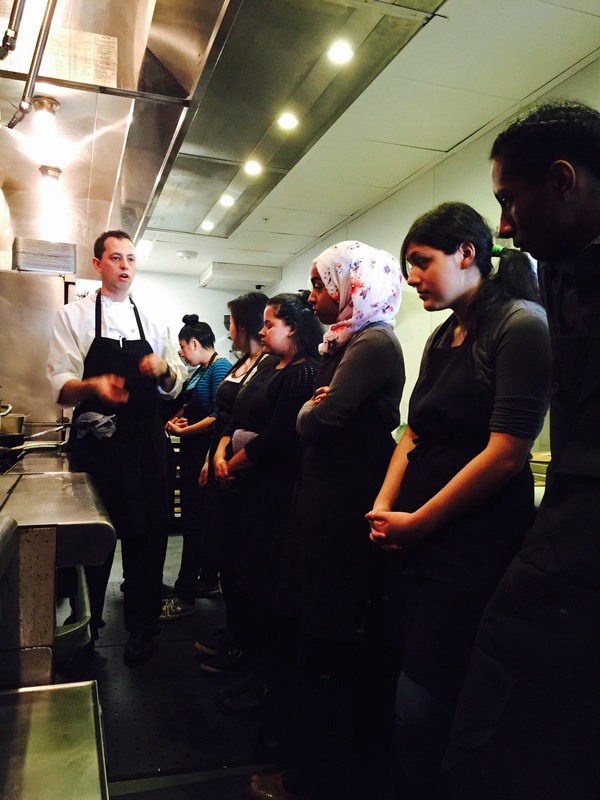 After the tour, Chef Walter reviewed us on kitchen safety that we were all familiar with such as washing hands, the claw, knife safety, etc. Wait- did I mention we got to wear aprons which don’t seem to be a big deal but it made us feel more like we were part of it! We could’ve worn chef coats but there were not enough. Anyway, back to the story, he set up cutting boards with different things to be chopped and after we choose which one we wanted to do, he showed us how we should cut it and helpus if we had any trouble. For example, I had the shallots. I had to dice them into fine little pieces which was difficult at first because when you made cuts into the shallot and start chopping it would fall apart, but after a while with the help of Chef Walt and Elizabeth helping me along the way I was able to cut the shallots with more confidence. 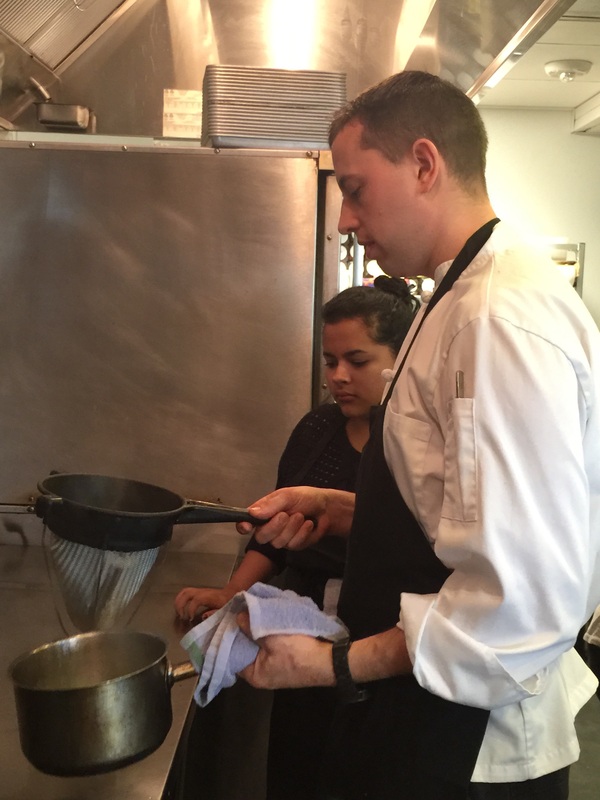 After a while of chopping, we stopped what we were doing and started to clean up, Chef Walter gathered everyone around the stove and showed us the process of the cauliflower dish. First, the pine nuts were already roasted before we got there. My fellow FEEST intern, Licely helped rehydrate the raisins, then Chef cooked the cauliflower on one side until it was nice and golden brown. He added salt and lemon juice for flavor, also the herbs we helped chop. He then added the pine nuts and raisins and bam! There you had it! He made four more servings and let’s us eat, he also served us drinks. I asked for a Shirley Temple, which was something new I have never tried. When you first bite into it you get the acidity from the lemon and the savoriness from the cauliflower but then the sweetness of the raisins balance the two and the pine nuts give it nutty crunch that gives the dish body. It was really delicious. Another one of my fellow FEEST interns, Gloria kept asking people if they were gonna eat the rest of their food since she enjoyed it so much. The trip to Tallulah’s was a fun one we learned so many things there and got to experience new things there. I will definitely go there again to eat and enjoy the atmosphere there.